The Outdoor Section contains three main components. A compressor, fan motor and a 110F degree hot surface. The compressor pulls the refrigerant from the indoor unit into the compressor, compressing the refrigerant and increasing its temperature to approximately 110F degrees. The 110F degree refrigerant is pushed into the copper tubes attached to the hot surface. The outdoor fan blows ambient air across the hot surface. For instance, if it is 90 F degrees outdoors, the 110f degree refrigerant will reject its heat content to the ambient air and the heat always flows from a higher temperature to a lower one. The hot surface is called the condenser coil. The refrigerant that exits from the outdoor unit is sent to a metering device. The function of the metering device is to reduce the pressure and temperature of the refrigerant. This cycle is continuous. Indoors The temperature of the refrigerant is lowered below the room temperature to collect heat from the room. The heat flowing from higher temperature room is then passed over the cold refrigerant. Outdoors The temperature of the refrigerant is raised higher than the outdoor temperature, which then rejects the heat to the ambient air. By raising and lowering the refrigerant temperature below or above the surrounding ambient air, heat is absorbed where it is objectionable and rejected to where it is not. Recap Room heat is absorbed by the cold refrigerant and then rejected to the outdoors. 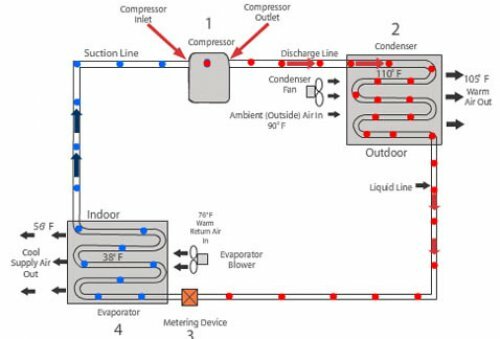 The room heat absorbed by the cold refrigerant is sent to the outdoor unit where the refrigerant is compressed. The compression of the refrigerant raises the refrigerant temperature above the outdoor temperature. The high temperature refrigerant rejects the heat that was absorbed at the indoor unit emitting it to the outdoors. 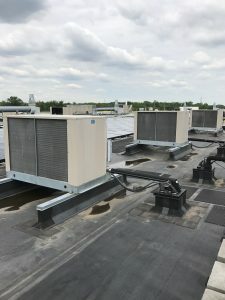 Do you need commercial air conditioner repair that is reliable and efficient? Look no further than Bergen Refrigeration. Our HVAC/R certified technicians will install, repair and service your commercial units, whether they are heating, air con or industrial refrigeration. As part of our commercial air conditioning service, we will make sure your unit is running at its optimum level and diagnose any problems that need fixing. Our technicians can then fix the problems to give you an energy efficient system. Invest in A/C service with Bergen Refrigeration knowing that your entire system is cared for with the proper testing equipment and tools.